Our team is on the ground and in Bor Town making preparations for the training that will start on Monday! We’re generally doing well, staying at the Modern Hotel. Bishop Philip has come to greet us as well as some of the teachers and Michael Kuany’s Brother. We’re all glad to be here and so far staving off any sickness. 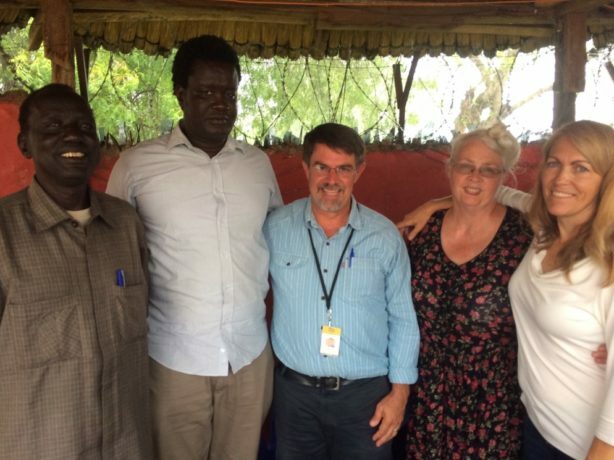 Michael Mayen, our board member on the ground in Juba, has arranged for some amazing administrative help for our team on the ground. Everyone is pitching in, including Daniel Kuany and the head of the school district in Jalle. As expected, there are some challenges, primarily transportation for teachers to the training and the location of the training. The Ministry of Education was supposed to provide the space for the training, but turns out they reserved a hall at a hotel for us @ $200 per day (on us- which I actually expected. They are broke and don’t have a hall of their own). Upon arrival, we found out that the hotel would only let us use the hall if we agreed to buy breakfast, lunch, snacks, water, and tea for each teacher, boosting the price to close to $1000 per day. So we began enacting plan B, then plan C, and landed at plan D: Bishop Philip’s church agreed to let us use their space, a large tukul. In return we replaced things that had been taken in the war a few years ago: chairs, two tables and supplies for tea. This cost right around the same amount as seven days in the hall without the food, with the added bonus that local people are the beneficiaries instead of the hotel. Plus we got to experience the challenges of teaching and learning in a Tukul: it’s dark, there’s no electricity, stuffy, and hot. These are the issues which our school building in Jalle is designed to tackle and some of the key reasons why the Jalle community endeavored to build a school building to begin with. 1. Walk only on the “solid mud.” Learn to recognize the difference between mud which can support your weight and what I will call “trick mud.” This is mud that your foot will instantly sink into if you attempt to step on it. It is not unlike driving with ice on the road, there is the ice you can see, and there is the ice you cannot, which some call “black ice” as it is the same color as the black tar on the road. The two levels if mud are both reddish. There is also the mud that is obviously going to swallow your feet, it is a bit soupy. Even a man who has been “footing” this ground his whole life, will sometimes have to check the ground. 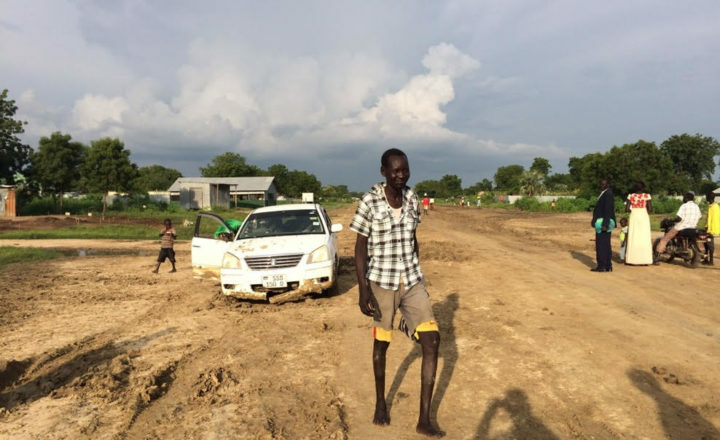 When we arrived at the Bor Airport yesterday, before Bishop would even let us out of the car, he cautiously tapped all the ground around where we would place our feet upon exiting the car. 2. When there is little solid mud available wear “gum boots”, or what many of us know as rubber rain boots. I think that these are mostly worn by men as I didn’t see any women wearing them. 3. If you don’t have gum boots and there is no solid mud, take off your shoes and carry them. This means walking bare foot through the mud, which will then coat ones foot as though the road itself colored a boot onto the foot and ankle. There is no shortage of massive puddles which you can then wash your feet off in. But the shoes are always clean. Except for mine, because I am not yet a master at traversing this mud, though I am improving.